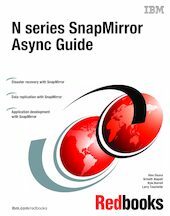 This IBM® Redbooks® publication presents an overview of implementing N series SnapMirror Async technology, with step-by-step configuration examples and recommendations to assist the reader in designing an optimal SnapMirror solution. There are several approaches to increasing data availability in the face of hardware, software, or even site failures. Backups provide a way to recover lost data from an archival medium (tape or disk). Redundant hardware technologies also help mitigate the damage caused by hardware issues or failures. Mirroring provides a third mechanism to facilitate data availability and minimize downtime. SnapMirror offers a fast and flexible enterprise solution for mirroring or replicating data over local area, wide area, and Fibre Channel (FC) networks. SnapMirror can be a key component in implementing enterprise data protection strategies. If a disaster occurs at a source site, businesses can access mission-critical data from a replica on a remote N series storage system for uninterrupted operation.